Somewhere out on the high seas, an InkBot raises a spyglass to their one remaining eye, laughing softly to themselves as they spot their next victim, an overloaded merchant limping through pirate-infested waters towards home. Piracy is its own reward, they say, but chests full of gold sure help keep the crew happy! 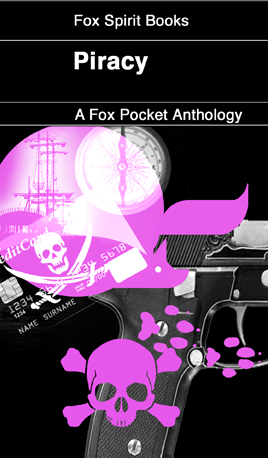 Fox Pockets Vol 1: Piracy is out now, including stories from InkBots Rob Haines and K. C. Shaw! Buy the adorable pocket-sized paperback here, or the exceedingly portable e-book here. Rob is a writer and programmer, living and working in Wales, UK. His work can be found at Every Day Fiction, the Drabblecast and Unwinnable.com. He is currently seeking representation for Coquus ex Machina, a historical fantasy novel. This article was written on 05 Jun 2013, and is filled under Short Stories.